Priyanka Chopra Has Some Interesting Views On Diversity. We Break Them Down. We’re less than ten days away from the season two premiere on Quantico, which means that star Priyanka Chopra is currently making the interview rounds. As soon as I logged into Facebook Thursday morning, I discovered that many of my friends were sharing Refinery29’s splashy new profile of the 34-year-old star. Unfortunately for Chopra, people weren’t posting about her stunning photos or their excitement over the return of the show. Instead, there was plenty of side-eye towards her views on diversity in Hollywood. After reading the piece, I immediately reached out to my friend Asha Sundararaman, so that we could have one of our epic Gchat conversations breaking the piece down. An edited version of that conversation is below. Lakshmi: Asha, what was your first thought once I sent you the new Priyanka profile? Asha: That I wish Quantico were a better show! Asha: No actually, it was about the headline. When you say something like “I don’t want a label” (and yes, that might just have been the headline writer), you’re usually missing something fundamental about today’s global culture and the way it operates. Lakshmi: Yes, I’m instantly wary of any celeb who tries to play that ‘don’t put me in a box’ game. She could have taken a moment to talk about the Indian feminists who have been working to change this. Or mention the current movement to police the way Muslim women dress in Europe and the outrage about that. Instead, we don’t get much. Asha: I’m also wary about people who invoke Hindu goddesses. Because there are so many problematic stories involving women in Hinduism. Lakshmi: Yes. Also, every time I see that I’m like INDIA IS SUPPOSED TO BE A SECULAR DEMOCRACY, FOOLS. Asha: Also true. India does not have goddesses. Hinduism has goddesses. They are not one in the same. Lakshmi: And it just doesn’t help when perhaps the most well-known Indian celebrity in the states is pushing that Hindu goddesses equals India narrative. Asha: Way to play into stereotypes, Priyanka! Lakshmi: Oh! Well, you missed a treat! There was something else that struck me. When she was talking about Quantico and Alex Parrish, she says she speaks, thinks, and looks Indian.” What does that even mean? Lakshmi: This is a good time to mention that like Alex Parrish, you’re also biracial. What did you think of the portrayal Alex’s identity? Asha: It seemed super muddled to me. In full disclosure, I didn’t finish the season. I got bored. Lakshmi: You’re definitely not alone. Just from the feedback I’ve gotten from my recaps I think a lot of people stopped watching because the storyline was too hard to follow or it just didn’t capture their interest. Asha: But the whole interview seemed to just stress Priyanka’s distance from the American experience. Anytime someone starts ROY G BIV-ing I stop reading. Green! Blue! Pink! Asha: Hahaha. I think it just illustrates the disconnect between people who grow up as minorities and people who grow up as the majority. She has the luxury of not thinking of herself as a “woman of color” because in India she’s part of the majority culture and her time in Hollywood is just a lark of sorts. So she gets to disconnect from American reality. Lakshmi: Definitely. And Priyanka, as a light-skinned, high caste person has known a sort of privilege in India that most Indian women will never know. Of course she doesn’t care about color! She has the color everyone has always cared about. Asha: Exactly! And now as a Hollywood star, she still doesn’t face what most people go through on a regular basis. Lakshmi: Reading that quote also made me realize that she probably completely didn’t understand why people were upset a few years ago when she was cast as Mary Kom – the Indian Olympic boxer from Assam who has a distinctly Northeast Indian appearance. Asha: Nope, she has no idea. I couldn’t believe they cast Priyanka. That was ridiculous. Lakshmi: When the casting was announced, Quartz did a great list of actresses from the region who would have been better picks. Asha: It’s true that Bollywood is just as exclusionary as Hollywood. The regional film centers barely make up for them. Lakshmi: Yes, and anytime a role requires you to don “prosthetic eyelids” it’s just best to run away as fast as possible. Asha: Haha. And it just plays into India’s vision of homogeneity. When the biggest film industry in the world is only made up of a certain look, it’s easy to forget the diversity of the subcontinent. Lakshmi: Definitely. Part of the reason I wanted to do this post with you is that I know that we both have had a lot of conversations about how some immigrant members of our families don’t seem to understand race in the U.S. and how Priyanka’s quotes really embodied that. What do you wish you could tell her before her next interview? Asha: Open an American history book. Was that too mean? Lakshmi: Not mean, but not likely? Lakshmi: The ‘don’t call me a WOC’ bit was really weird because her show has tons of really great WOC characters. Nimah and Raina were game changers in the way Muslim women were portrayed and Miranda is just fantastic. Asha: This is off-topic, but there’s also this quote: “I’m not, by nature, physical,” Chopra says. She doesn’t train or keep a regimented gym schedule. Mostly, she assumes she’ll get a little beat up on set.” But that’s a different conversation. Lakshmi: Also, I don’t believe it. Lakshmi: I mean, I believe she hates the gym, but I don’t believe she NEVER goes. Asha: Don’t we all. She’s probably trained her entire life. I mean to be Miss World, you have to at least do some exercise. Lakshmi: Exactly! I’ve seen Miss Congeniality! I know what those girls go through in order to win. Asha: But back to your original question. I wish I could tell her that diversity is about humanity. It’s about recognizing that people experience the world differently depending on history, culture, gender, religion, birthplace, etc. It’s about not erasing those experiences or distilling them down to a single narrative and it’s about being comfortable with that. Lakshmi: Definitely! On a lighter note, I do appreciate PC’s personal campaign to get herself cast as James Bond. Asha: Yeah, that’s pretty cool. I wonder how a female Bond would change the character, especially since he’s such a womanizer. Lakshmi: Also, it’s just neat that an Indian woman wants to play an iconic British character. Imagine what Twitter would be like if that happened! Asha: Hey, I know a woman who goes by “James.” I think her given name is Jamie, but it’s always been “James” to us. Lakshmi: That’s neat. I think, judging from the way she portrays Alex Parrish, Priyanka would LOVE to play a character that sleeps around as much as James Bond does. And I mean that in the nicest, most encouraging way possible. Plus, a postcolonial take on a character that was created at a time when the British Empire was crumbling would be so interesting to watch! To see an Indian woman be a hero and save everyone, it’s really a more countercultural idea than Priyanka might realize. Asha: So true. It’s like she doesn’t want there to be barriers, but she also doesn’t realize how they got there in the first place and why they stick around. Lakshmi: Here’s another quote from the piece that definitely lends itself to that theory. “I want to be able to conform, to evolve, and be whoever and go wherever. Just like everyone else,” she says. Asha: Yep. But you can’t just do that willy-nilly anyway. There has to be some self-reflection involved (which there clearly wasn’t when she played Mary Kom). Well, I’m interested to see how Quantico‘s writers continue to portray her Indian identity next season. Maybe we’ll see her mom more! I still crack up when I think of the fact they named her mom Sita. Asha: They probably couldn’t think of other names. Sita is one story that I have a hard time getting behind but also another conversation. Lakshmi: Well, I know your lunch break is almost over, so I’ll let you go now. Thanks for chatting about our favorite ridiculous TV show with me. Lakshmi Gandhi is a journalist and pop culture writer based in New York. Her work has appeared in Metro New York, NBC Asian America and NPR’s Code Switch blog, among other sites. She likes it when readers tweet her @LakshmiGandhi with their thoughts on Asian American issues and romance novels. 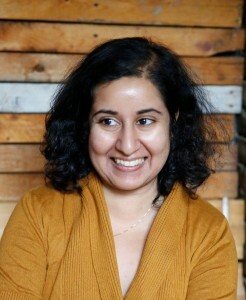 Asha Sundararaman is a freelance writer, photographer based in Oakland, California. When she’s not discussing pop culture, she can be found in her kitchen blending the flavors of her Southern and Indian roots.